Don’t get me wrong, I’m no expert on where you should splash out the cash and where you shouldn’t. However, I feel I have enough to go on to realise where to save the money and where to go all out. The drugstores have so much to offer these days, so this is where I think you could save yourself a few pounds here and there! From experiences, one of the main things I’d spend on is eyeshadows. There are some good drugstore eyeshadows, however they usually lack pigmentation and lasting power. I have the Naked 3 palette, which I adore and the eyeshadows are amazing. Much better compared to my old MUA palette. I think some people would disagree with me here, but I’d spend on a mascara. I know there is a huge range of mascaras in the drugstore, but I have never found one I completely love. I love Benefit mascaras as they stay strong all day, and don’t leave you with annoying black marks under your eyes! Lastly primers. I’m not a massive expert on the topic of ‘primers’, but comparing the high end and drugstores, I’d say high end ones just get it better. Of course one of the most popular is Benefit Porefessionals, which is amazing. The majority of my makeup collection is drugstore based, so I have a rough idea of what really works. My first one would have to be eyeliners. Whether its just a simple kohl eyeliner or liquid liner, there is such a huge variety available in the drugstore. My favourite kohl eyeliner is actually from Avon, and it works perfectly well for me, and at a very cheap price you can’t go wrong. Secondly I’d say concealers. 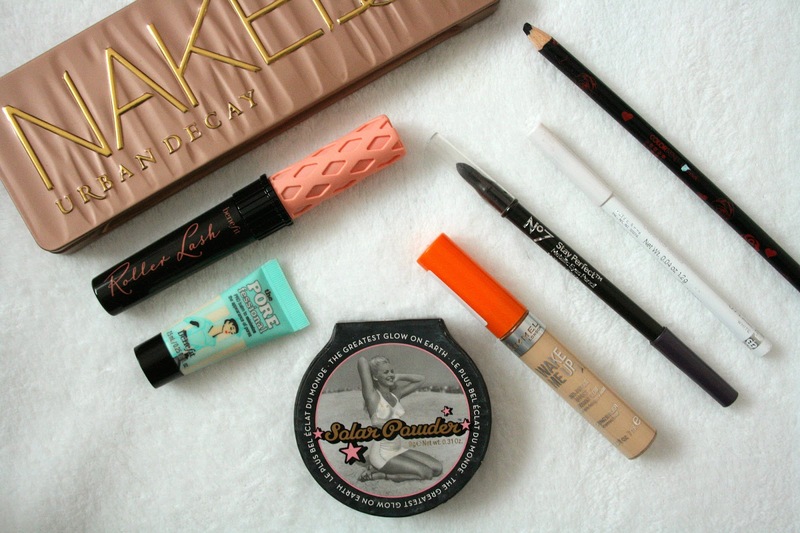 I’ve only ever used drugstore concealers, and they’ve always worked so well for me. My two favourites being Rimmel Wake Me Up and Collection Lasting Perfection. Finally, a good powder/bronzer. I’d say powder is definitely something you don’t need to splash out on, but maybe bronzer is the exception for a splash out. Where do you save your money and splash it out?